Bossy Italian Wife : Embrace Being "Perfectly Imperfect"
I talk a lot about authenticity and I recently read Brene Brown’s “Gifts of Imperfection” which deals with the subject in-depth. Great read and I totally recommend it because in a world that is obsessed with perfection, being yourself can often be overlooked. We’re bombarded from sun up to sun down with messages about the way we are “supposed” to be. From ads in print and media to people tracking every calorie they intake it seems we’re told we need to be skinny, energetic, beautiful, kind--but not a doormat--able to accomplish everything in a day, and on top it all we are supposed to be interesting and lead extraordinary lives. What a load of crap. Who in their right mind could be all these things? Certainly not me. But I should preface this by saying I am a perfectionist in recovery. For many years, I tried with little success to be perfect. It’s exhausting and it’s impossible because you just can’t be all things to all people. I have a short list of the perfect things I tried to be: daughter, sister, wife, employee, person, woman, and feminist. Short list. And then, when I realized that there was absolutely no way for me to be perfect at any of these things, let alone all of them, I nearly had a nervous breakdown. That was when I started digging deeper and I found Brene Brown's work, which has really been instrumental in helping me realize that these struggles are normal and (thankfully) curable! I had a situation recently where someone ripped me apart for my book (which, by the way, you should totally read). It was hurtful and, in the heat of the moment, without even thinking twice about it I blurted out, “But this is who I am and people like that!” As I heard myself saying it, I was really proud of myself. I was even a bit joyful to be honest. In my book, I admit to being imperfect. I admit things I have done that are strange and real--and I own it. It’s not perfect, but it’s me...and people don’t like me in spite of it, they like me because of it. If that makes someone else uncomfortable, guess what? Too bad. One of the best gifts we can give ourselves is to be ourselves. This can sound deceptively simple and often we try to overcomplicate the issue and make excuses as to why we can’t be ourselves. When it comes down to it, we can’t be everything to everyone all the time, and the cycle of trying to please everyone is what makes us unhappy with ourselves. If anything, as humans, we deserve to be happy. The beauty of embracing the things that make us “perfectly imperfect” is that in the process, people enjoy us much more and we end up pleasing others because people are drawn to authenticity. I’ve learned this as a writer over and over again; whether I do everything right or everything wrong, the outcome can often times be the same... the most important element is that I just be myself. 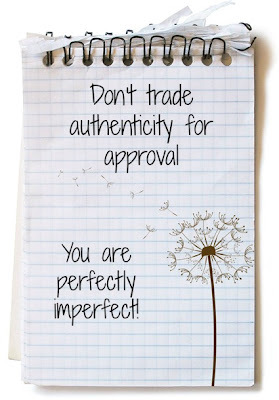 Don’t be willing to trade your authenticity for someone’s approval. It’s a recipe for disappointment. That is not to say that you won't find yourself in moments where you are trying (once again) to be perfect or people please...that is to say that in the trying itself there is success and awareness. Little steps lead to big "ah-ha" moments and life blooms in new and interesting ways. Tell me, what is one way that you could be more yourself today? Do you struggle with being perfectly imperfect like me? Let's discuss in the comment section below!